Emma and Patrick, two medical professionals, recently joined our country manager, Jimmy Lama, on a trek through the Helambu region in which Mondo and the Helambu Education and Livelihoods Partnership are working to re-build schools following the earthquakes and enhance education. This is the first part of a series of blogs on their journey into Helambu. We began our journey from Kathmandu by jeep, kindly being given a lift by an engineer and his family, with 7 of us all squeezed into the vehicle. It was an uncomfortable three hour journey along muddy tracks, saturated by the monsoon rains. We spent some time trying to pass a bus that was being dug out of what resembled a small swamp by its passengers, with limited success. Despite the obstacles, we were in Melamchipul in time for a yummy lunch of dal bhat, providing us with energy for the unexpectedly tough walk ahead. We were dropped off in Chanauti Bazaar at the bottom of a winding track, stepping out into the beating midday sun to begin our ascent with Jimmy. The hike to Pading was slow and exhausting in the afternoon heat, the sun burning the backs of our necks and the sweat soaking our t-shirts. The only times we felt able to look up from our boots to admire the spectacular views were the occasional well-needed breaks, lying under the shade of the frustratingly sparse trees. After three hours of seemingly endless uphill trudge, we finally reached the village, where we were rewarded with hot sweet tea at the busy construction site of the new school. Situated on a hilltop overlooking a panoramic vista, the building has two stories, each with 4 classrooms for the 260 pupils, a separate toilet block, administration buildings and an area of playground, which is currently home to the TLCs where the pupils have been learning since shortly after the earthquake. When we visited there was no roof on either the school building or the toilet block, although we hear that the school roof will soon be in place just days after our visit, there are no stairs yet in place to the upper floor and the hole in which the septic tank will sit was still being dug. There are also plans to build a retaining wall between the new school and its former site to further ensure the safety of the structure, should another disaster like last year’s occur. 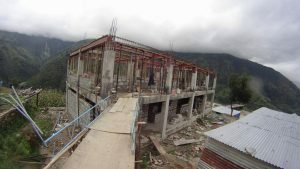 This resilient building is due to be finished in October, after only 6 months of construction so the pupils can continue their education in a safe and secure learning environment.